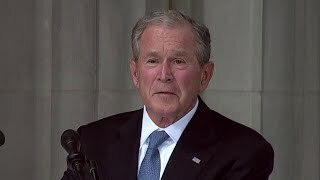 George W. Bush is being rehabilitated in the age of Trump, as the second worst president in American history is burnished by the absolute worst. So far, at least, Bush's lies were more consequential. Trump lies about having been a good student or about being a billionaire. Bush's national security adviser, Condi Rice, batted away doubts about Iraqi nukes on the grounds that "we don't want the smoking gun to be a mushroom cloud." Secretary of Defense Donald Rumsfeld, challenged as to where exactly these nuclear sites were, lied that we knew... "We know where they are. They're in the area around Tikrit and Baghdad and east, west, south, and north somewhat." Maybe underground on the way to China? Secretary of Defense Colin Powell was sent to be a laughingstock at the United Nations with a power-point on how Iraq had mobile biological weapons labs on Winnebagos. Biological weapons labs need clean rooms to keep the microbes from escaping. Where, pray tell, would you put a clean room on a Winnebago? And would you really want to be sweating over a petrie dish on Iraq's pothole-filled roads? This sort of glib rhetoric was to cost the lives of nearly 5,000 American military personnel and the lives of several hundred thousand Iraqis, leaving hundreds of thousands of widows and millions of orphans in its wake. It would leave some two million Iraqis wounded. It would displace, i.e., make homeless and exile, 4 million Iraqis. It would destroy Iraqi industry and leave some parts of the country with a 70% unemployment rate. Bush's lie about nukes had a cover. His administration swept up chemical, biological and nuclear weapons under a single rubric, "weapons of mass destruction." The very phrase was a lie, an attempt at an alibi by a criminal administration.